Show your company's personality and get connected with your customers. Grow your seed into a fully fledged ecosystem that expands its reach further than you could imagine. 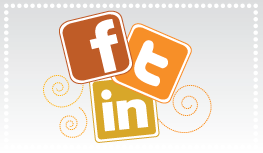 We will set up or strengthen your social networks (Facebook, LinkedIn, Twitter, etc.) and create engaging content that will foster interaction and communication between your brand and the public. A brainstorming session with your representative to truly understand your vision. A personalized marketing plan that is based around YOUR budget and YOUR goals. Excellent customer service where your satisfaction comes first.